Hatters winger Danny Green believes tonight’s Capital One Cup second round clash against Premier League Stoke City could be just the game for his side to turn their disappointing start to the season around. Although Luton are huge underdogs to progress in the competition and head into the game on the back of a disappointing 3-2 defeat at Yeovil on Saturday, when asked if the match might be something of a distraction, Green said: “It could work the other way. The Bristol City game worked well and gave the boys a lot of confidence as they played really well. We deservedly won the game, so we deserved the tie with Stoke. “Hopefully we can do the business and put a bit of form together now if we can beat them which we are more than capable of doing. 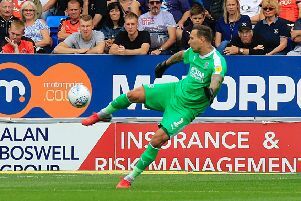 Green is hoping that a break from league action will also bring the best out of Town, as it did when beating Bristol City 3-1 in the last stage. He continued: “The shackles are off and you can go out and express yourselves. We want to go out there and win but it’s not the end of the world if you don’t win the game. After Stoke’s visit tonight, Luton host Portsmouth on Saturday, before entertaining Leyton Orient in the Johnstone’s Paint Trophy. The real action then starts again, with trips to fellow promotion hopefuls Cambridge United and Notts County in the league and Green is well aware of the importance of those matches, despite the season remaining very much in its infancy. He continued: “I suppose the next four games are going to be really tough and going to shape our season. “Hopefully we can go out there, do the business and get the wins we should be getting.